This is the great season for hops shoots. I gather a large handful every day or two, taking care to snap them off where the stem is tender and brittle. 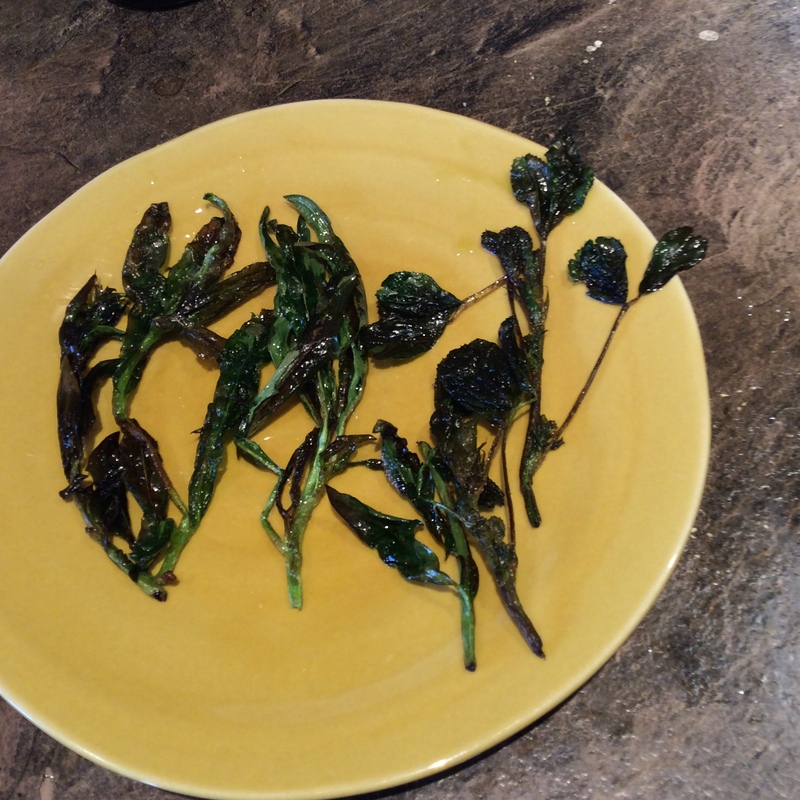 I wash them, cut the bundle crosswise in pieces about an inch long, toss in a hot skillet with a generous amount of good olive oil, and sauté over medium-high heat, turning frequently, until the stems are tender and some of the leaves are brown and crisp. Add salt and serve. They have a “wild” and slightly bitter flavor which I love alongside very flavorful meaty main dishes. This spring I started to experiment with other shoots. I have been eyeing the invasive tendencies of my goji bushes, which routinely send suckers out 10 feet to send a shoot up right where I don’t want another goji plant. They are turning up everywhere as the weather warms. I knew that their foliage was edible but had never been much impressed with the taste, and there aren’t many leaves per bush. The shoots, on the other hand, are bulkier than the leaves, green, tender, and a nuisance unless removed. 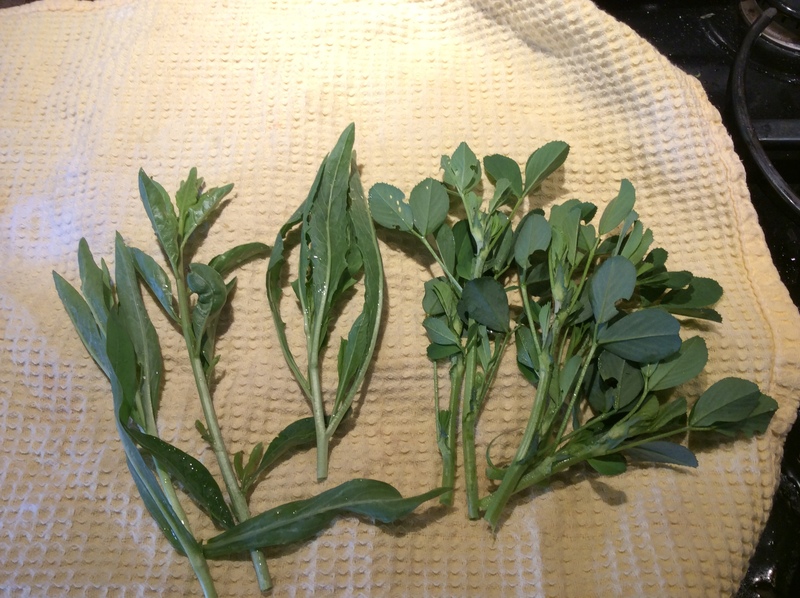 Yesterday I gathered young shoots of silene (bladder campion,) goji berry bush, perennial arugula, and alfalfa to experiment with ( shown L to R below.) I wouldn’t try cooking with any shoot that didn’t break off with a clean, brittle snap. You don’t want them woody. I didn’t cut them up, just washed them and let them drain. Then they were put in a skillet with some olive oil and fried over medium-high heat until the leaves were crisp and browned. I would guess that it was about two minutes a side. Watch carefully; the line between browned and burned is crossed in milliseconds. They were drained on paper towels, salted, and eaten. They were actually a rich brown in spots, not black as they appear in my photo. 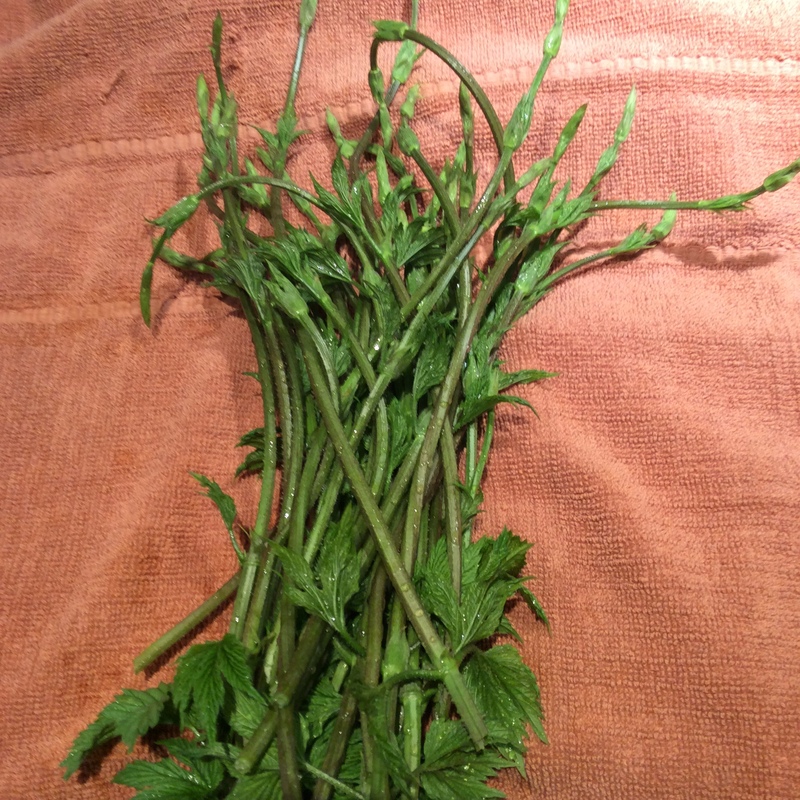 The alfalfa and silene shoots were crisp and pleasant enough to eat, but all I could taste was olive oil and salt. I had used a wonderful olive oil so I didn’t mind that, but I do like a vegetable to taste of itself. 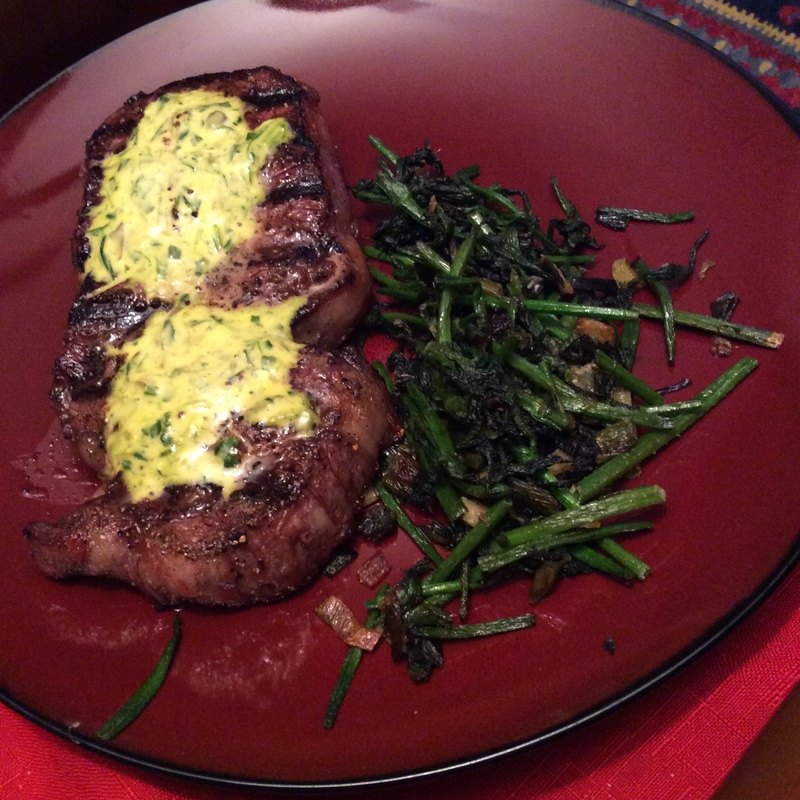 The stars were the goji and perennial arugula shoots. 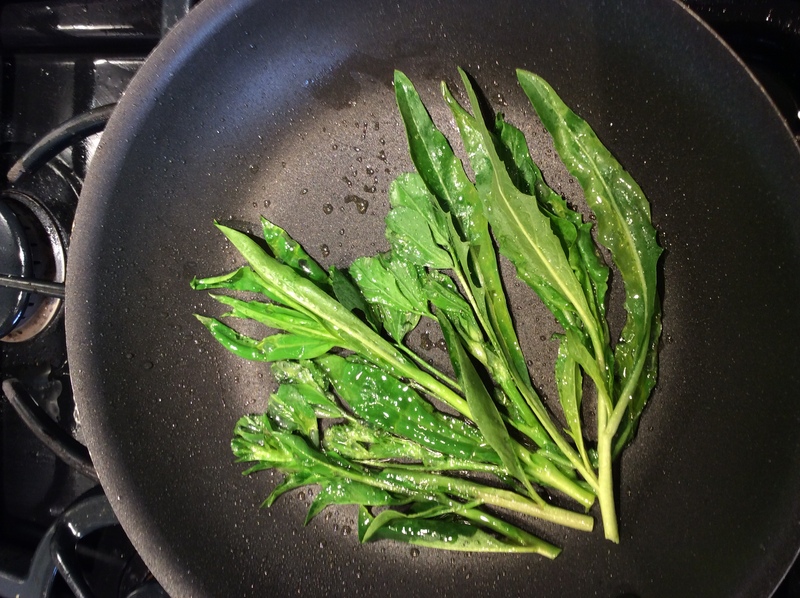 The hot and mustardy flavor of perennial arugula was tamed and made interesting but not excessive, and the goji shoots had an herbal flavor and a delightful texture. I will definitely cook them again. I can easily cook them for my husband and myself, but they need lots of room in the skillet to crisp, so I don’t think it’s practical to make them for more than two people. They are too fragile to withstand being dipped into anything, and are best eaten on their own. They are a passing fancy and to be enjoyed as such. I only wish that all my invasives could be dealt with by eating them. There are many other shoots to consider, and this is a time of year for perennial veggies to shine. Meaty young milkweed shoots should be wonderful. It has taken me three years to get a milkweed patch to germinate so mine are still spindly infants, but if you live in an area where it occurs naturally, do give it a try. Asparagus, the classic shoot, is wonderful when pan-fried like this. Young slender green onions can be treated this way with good effect, and green garlic could be great, although in this one use I would use only the white part, since the leaves can seem stringy if not chopped in cross-section. I will soon be experimenting with shoots of young wild lettuce as it starts to bolt. I think these would need to be blanched first to reduce bitterness, but I’m not sure yet. I’m very fond of using the fresh tender shoot-tips of coppiced mulberries as a green, and I think they would be very good given this treatment, but they don’t come along until about June, so it will be a while before I find out. See here for a discussion of the ins and outs of selecting and eating mulberry leaves. The young second-year stems of chard leaves that emerge when an overwintered plant sprouts in the spring, before it starts bolting to seed, might be good for this, trimmed of their green leafy bits and maybe cut in inch-long chunks if they seem a bit on the stringy side. And I have written before about using the young flowering shoots of scorzonera this way, and they are definitely the highest culinary incarnation of that tough perennial. I often mention Cook’s Treats, the series of improvisational tapas for one that I enjoy in the kitchen when nobody’s looking and I’m doing other things. Four or five tasty shoots, thrown in your smallest skillet with olive oil while you’re working on other things, make a great cook’s nibble. You will need to give them your undivided attention for a few minutes and that’s all, which fits well into the rhythm if many kitchen tasks. I’m trying to coax several goji berries into growing on my food forest. Very interested in your eating the shoots which I plan to try myself once there’s some for harvest. Never heard of them sending out runners. I might rethink where I have mine planted. This post would definitely have multiple like-stars if that was possible. I am finding gojis to be garden thugs, or to frame it more positively, they are very well equipped for survival. I don’t think it has anything to do with variety or strain, because I started with three plants from three different nurseries and they are all like this.usually the daughter shoots show up 6-10 feet from the mother plant. I don’t find them any real trouble to control. I pull up the root and eat the shoot if it’s still tender, so I am more glad than otherwise for their spreading tendencies. 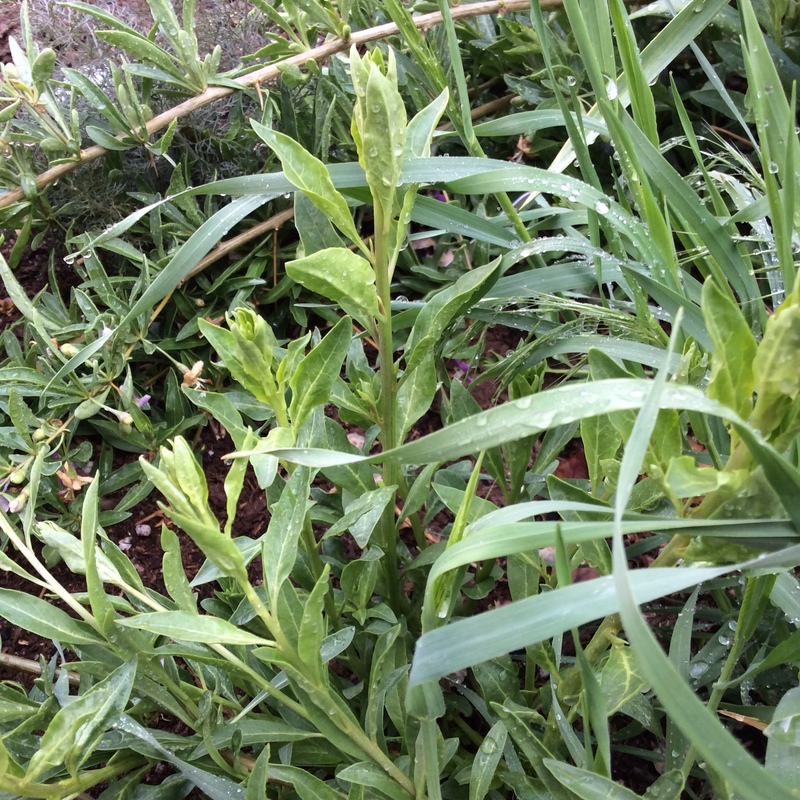 As I wrote this post, I envied you your mature Turkish rocket plants. When mine fill in, I want to try frying the shoots in olive oil like this.